A very important aspect of Feng Shui is Yin Yang. Yin Yang means the balance one needs in his or her life to fully feel in control, relaxed and supported. This is what Feng Shui achieves: it has the ability to reduce your stress, whist helping you feel more supported by your work environment. Surely you will feel more confident and your income might even rise! First it is important to do a little office clearance, as a fresh clean start is the way to go and this is because a clean office means a clear mind. Therefore keep things clutter free. Also keep in mind that your cubicle or office is where you spend a lot of time, therefore keep your files and your desk organised! After that, create an environment that ensures that you want to work. Let your environment motivate you. To do so you’ll need to balance bright colours with the dark ones. Choose a lot of spirited colours that really brighten up a room and because natural light gives a balance to the darker energy, pull the curtains down. Your chair and desk need to be ergonomic. Ergonomic chairs give your back a great deal of support. Face the door of the room with your back. This is to make sure that you don’t attract negative energy in the office. A tall wall behind you or a solid surface will also help you to get rid of negative energy. When there is no way out for you and you do need to face the wall, then place some beautiful pictures of your accomplishments or natural sceneries to cheer you up. This will encourage and inspire you. Also photographs of your loved ones are a great idea to balance out any negativity. You can also put photos on your desk, of course. Another great way to balance the energy is to purchase a garden or mini waterfall. If that turns out to be to costly, go for some plants. This will provide for a more harmonious office atmosphere and will be good for the social relationships between you and your co-workers. If you have a boardroom it is advisable to have a round or oval table as it will provide you and your colleagues with an atmosphere of productivity, problem solving and negotiation. If you don’t have your own office the Feng Shui rules still apply. When you have your own cubicle liven it up with some of the advice that I mentioned before. 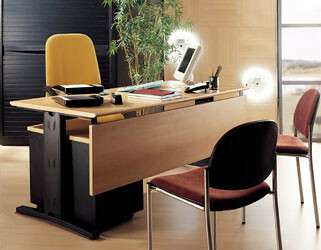 Use photos and plants on your desk and always remind yourself that a clean office, means a clear mind!